Ready for spit-up and breast milk and all sorts of yummy messes! Embroidering is my newest hobby; I picked it up a little over a year ago and I really love it. 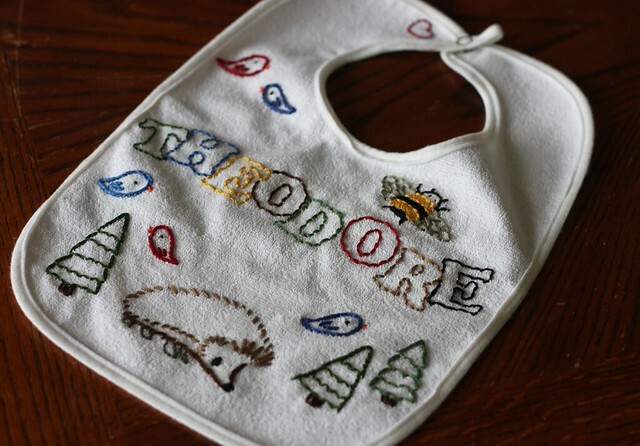 The patterns at Sublime Stitching bring embroidery to the 21st century – after all, their motto is “This ain’t your gramma’s embroidery!” But even grandmas would approve of the sweet little hedgehog and those pudgy birds, don’t you think? I’ve been a knitter for years and years, but this was my first stuffed animal! It’s hard to get a sense of scale from that picture, but he’s nearly a foot long from snout to curly tail. I used a pattern that I purchased on Ravelry, and it was fun to learn short-row shaping for this project. Isn’t he just the cutest? I used a cotton-acrylic blend, and it’s perfectly soft and cuddly. Any new babies in your life recently? What craft projects are you working on? Vovó is smiling down at you. What a wonderful aunt you are. 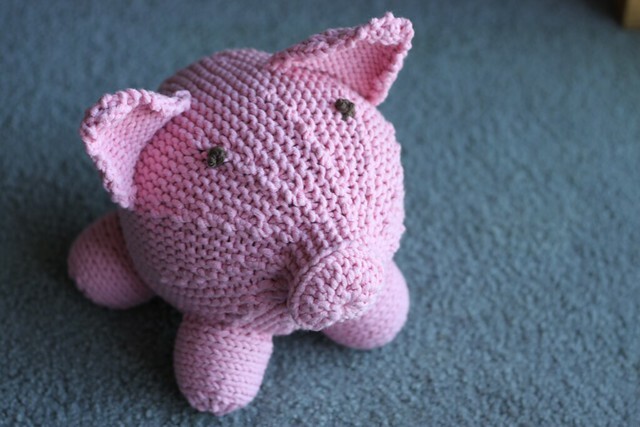 I haven’t gotten into amigurumi, but it’s on my to-do list – so many cute patterns! I started embroidering over the summer, but haven’t done much in a while. A new crochet/knitting group has just started in my campus so I’m spending more time on that. I’m organising a yarn bomb, which is so fun! Cute stuffed toys are sure to brighten up students’ days, so I think I’ll add some of them to our plans. Yarn bomb! I’ve never done anything like that but it sounds so fun.